I wish you strength! My hair hasn't ever been longer than BSL, and as I'm Scandinavian, I sometimes fear that my terminal length comes extremely early or my hair damages too easily to be able to grow long or something... But really, the only way to find that out is to keep growing and hope for the best, as frustrating as that can be. Safe way of "changing" your hair would be trying some new hairtoys. Preferably from the expensive end of the price scale so that you can then tell yourself that after investing to all those toys it would be awful waste of money to do anything dramatical for your hair. and against the cold weather ... oil oil oil i'd say, i already see the difference between here and where i live at the atlantique ocean: i put about two to three times more oil here! My opinion is that for most people, terminal length is greater than waist-length. The challenge is keeping the hair in good condition if your hair damages easily. 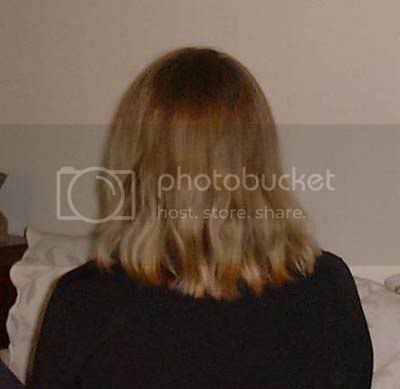 People who have hair that doesn't seem to grow longer usually have lots of damage, while most women who take good care of their hair end up stopping when they think their hair is "long enough". is much longer than BSL with lots of TLC. why would scandinavians be unable to grow long hair??? i mean, genetically we ALL come from a very tiny gene pool. I agree, I am half Norwegian on my father's side and his two sisters who were full blood scandinavians had at different times in their lives long long hair. I'm talking about hair that came down to their knees ! I think I get the long hair gene from them even though my hair isn't that long now (it's hip length) I have no doubt I can grow it that long it I can stand it being that long. more easily than other types of hair. i think that's just bullocks ... i have fairly fine hair, dyed and twice as long as my mother who has thick virgin hair and guess who has a great collection of split ends like every three months i cut her hair?? not me for sure. i think thick hair is a lot more porous and one has to be careful while combing. she only brushes with those plastic things cuze she says she can't go deep enough with a comb (not that she has more voluminous hair than me but well): if that what she likes to believe ... i call that laziness and noone should expect great hair using such tools. so maybe it's more resiliant than I think. I thought about cutting because my sides are so thin. But then I'd just have short hair that I would probably hate AND thin sides. Whatever is there, I'm going to nurture it to as long as it will get. Me too - thin sides - especially day after washing - the only time my hair looks nice is just after washing it - if I leave it for another day - baldy sides! Genetics hey! Giving my hair 6 months - if not happy with it then chop chop chop - off it all comes! i never really responded to the question: yes, i have thin sides too. always had them. i have them from my mother (who has rather coarse hair though apart form the sides). but i don't see why one should chop off their hair cuze it's long hair that covers it the best (in a center part of course). It's not just the sides... I am reaching the conclusion that my hair is too thin all over to be long - sometimes the dream is better than the reality..... I think I just have to face facts that my hair looks like a dead witch's hair when longer than shoulder length. I don't think my hair is particularly thin on the sides, but you could add kelp supplements to your diet. In addition to whatever hair vitamins you're taking, kelp helps hair to grow thick and healthy. If you can get to a bookstore that carrys Linda Page's Heathy Healing you can look up the page on hair growth. I've lent the book out, so I can't quote more info here. You'll need to be carefull if you've got thyroid issues-kelp's rich in iodine. Babyfine, instead of perming maybe you could sleep with a damp loose braid or a bun? Get some natural wave in there? Hi everyone. I have thin sides, too, and I've always hated it. I think everyone's sides are thinner than the back, because there just isn't as much area for hair to grow on. It also depends on your hairline. Mine is farther back than I would like, so that means less hair on the sides, also. It also means that I look best from the side with bangs.